The conversation turned, however towards a much more dramatic impact of having very affordable cameras with outstanding electro-optical performance being made available to anyone who can be bothered to point it in the right direction. COTS (Consumer Off The Shelf) devices that are not special will change the way in which we think about technology. I remember the first time I saw a GoPro. I was lucky enough to have the wonderful Suzy Perry ride my velomobile around a racetrack for the UK's Gadget Show. To get the shot, there were 5 GoPros scattered around the cockpit and were considered disposable in case the velomobile crash or the horse against which she was racing took a dislike to the big white egg shaped bike. Just like the introduction of portable radio cameras back in the 1980s, the fact that these little beasts can exhibit technical issues on screen matters less than the fact that the images from them tell your story in a way that cannot be done with a conventional, big camera. 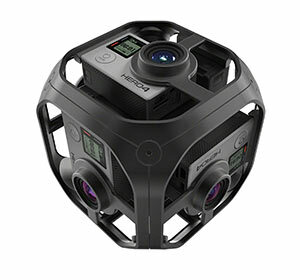 Whilst I am not convinced that VR / 360 video will be a big commercial success for broadcasting, I am sure that the 360 / omni camera rig will be used to capture pictures for traditional broadcasting. Watching the BBC's Spy in the Wild series shows what can be done. Clever editing hides the fact that the technical quality of the smaller devices is not as good as the big cameras, but the story telling is awesome. Some of the major broadcaster ban the use of DSLRs and other COTs camera types for technical reasons. It is worth remembering that aliasing in the camera cannot be removed and whilst it might be rare to have a scene where a small, bright torch is shone directly at the camera causing it to briefly respond with a zone plate type frequency sweep over the whole image (thank you, well known streaming service); aliasing has other effects. The public consume pictures over terrestrial, cable and satellite. Aliasing in the camera eventually increases the bitrate required to broadcast those images at high quality. That bitrate will be at the expense of other channels in the multiplex. Bottom line - nothing ever changes. If you want great images, get it right in the camera!